Futsal is set to break America this summer with a two-day tournament in New York taking centre stage. Some of the biggest names of Premier League yesteryears will take part as four star-studded teams complete in the International Futsal Cup. All four teams will feature multiple world-renowned soccer stars, blended with North American ballers. Ex-Liverpool strikers Michael Owen and Fernando Morientes are among the confirmed participants so far, joined on the list by former Manchester United goal machine Ruud van Nistelrooy. 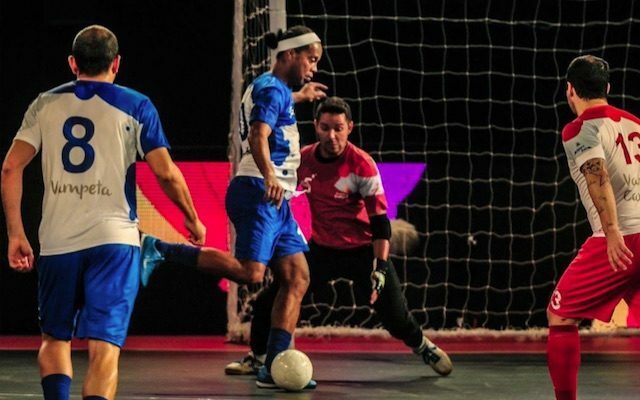 Futsal is the perfect platform for Ronaldinho Gaucho (pictured above) to flaunt his famous skills, while sharp-shooting left-back Roberto Carlos will fancy his chances of hitting the net a few times in a sport which averages an attempt on goal every 43 seconds. Global icons Ronaldinho and Carlos will likely steal much of the attention from fans, but fellow Brazilian Falcao could prove to be the main man when the action gets underway. Falcao – not to be mistaken with the Colombia and AS Monaco striker who shares his name – recently called time on a glittering Brazil career which saw him score well over 300 international futsal goals. The tournament format is simple, with two semi-finals taking place on Saturday, June 26, before a third-place playoff and the showpiece event on the Sunday. All four matches will be streamed online, but fans who attend in person will have the chance to meet the players as event organisers CG Sports Management are keen to put on a highly interactive spectacle.